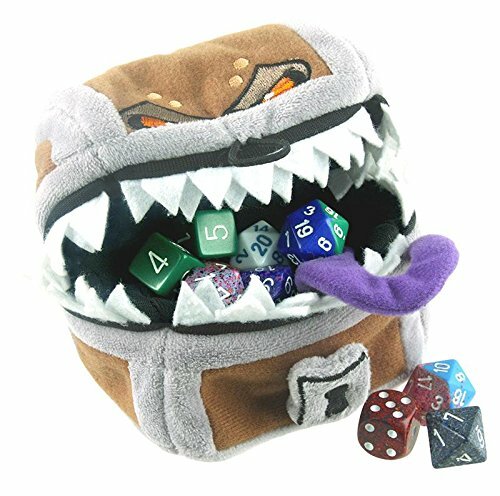 With this Dungeons & Dragons Mimic Dice Bag, you might just level up trying to get your dice out of the bag. This dice bag is shaped like a Mimic impersonating a small treasure chest. It comes complete with beady little eyes, lots of pointed teeth, and a long purple tongue to make melee attacks. On the plus side, it does’t automatically adhere to you so you won’t be grappled. This squishy Mimic is made with a soft plush material and offers a zippered compartment with an elastic loop to keep the Mimic tightly closed. It also includes a carabiner style attachable hook for storage on the go! It’ll easily hold a complete set of gaming dice and a mini or two but, it’s not big enough for much else. If you need a large dice bag (hello fellow high-level wizards), give the Bag of Dice Hoarding a shot. It’s perfect for D&D players and is sure to attract attention at your next game night. Just don’t let anyone lose any fingers. Dimensions: 5.1 x 5 x 1.6 inches. Official Dungeons & Dragons Mimic storage pouch for dice, minis, gold, etc. Zippered inner compartment and carabiner style hook for carrying. Who knows? You might just level up trying to get your dice out of the bag.